Want to try Bill Hirsch Miracle Paint to see if you like it? 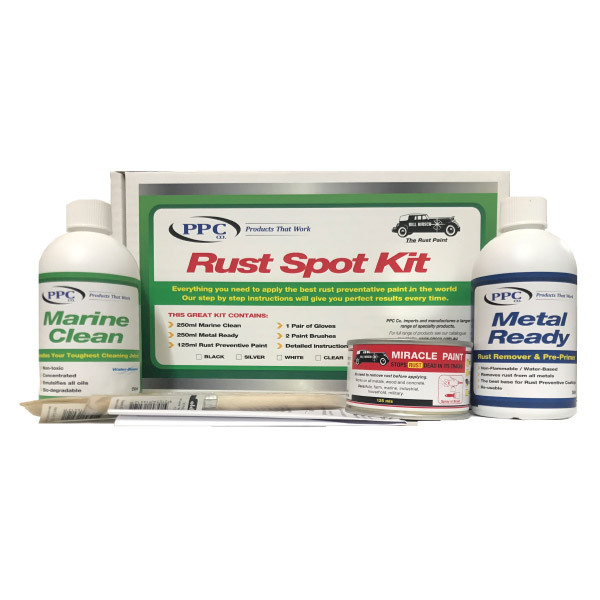 Now you can with the PPC Rust Spot Kit. Enough product to clean, etch and paint about 6 square feet, with 2 coats. 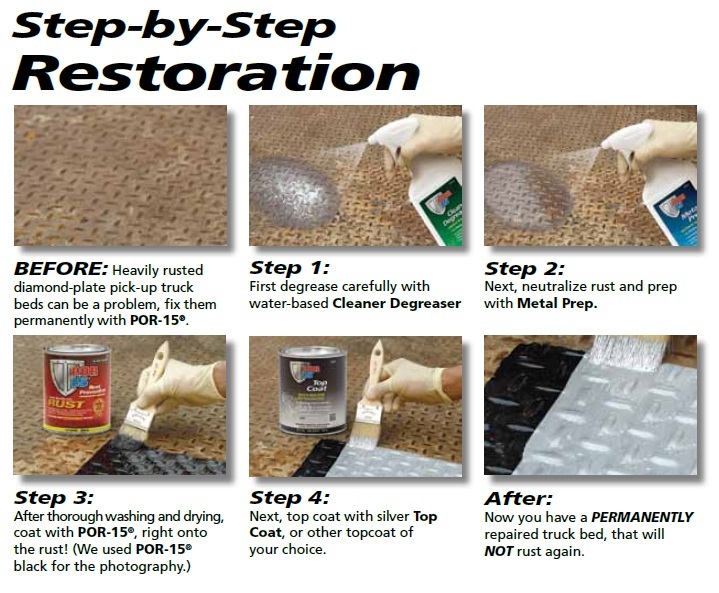 For customers wanting to try out our entire 3-step rust-stopping system, with our 3 most popular products. This kit gives you the cleaner, the etching/rust remover and the POR-15 rust preventative paint with your choice of colour. Essential if you think that your job has oily or greasy residue, or you are using new steel or aluminium. Enough to cover 1 metre square. Available in Black, Grey, Clear and Silver. Want to try POR-15 and to see if you like it? Now you can with the Super Starter Kit. Enough product to clean, etch and paint about 6 square feet, with 2 coats. POR-15� is a high-tech, high performance rust-preventive coating designed for application directly on rusted or seasoned metal surfaces. It dries to an incredible rock-hard, non-porous finish that won't chip, crack, or peel, and it prevents rust from recurring by protecting metal from further exposure to moisture. Use it to coat rusty frames, floor pans, farm equipment, marine equipment, or even a heavily corroded battery tray. I used this on my 55 Buick floors that I replaced the carpet on. Kit was the perfect size for my application. Above AND below. Excellent prep makes sure that you get an excellent job. Everything included. Even brushes and gloves. Bought this to try to protect an area under the cowl grill of a '71 Challenger. Area is difficult to access to clean and coat and not visible without using a mirror. Based on past results with POR-15 I believe this will work if I got it clean enough. At least the area has some protection and the Starter Kit is just the right size to perform the smaller jobs sometimes necessary. The kits are very complete and contain good quality accessories along with the Quality POR-15. I started using POR15 about 8 years ago and my original application is still in perfect condition. Thats 8 winters in Southern Ontario salt and still nothing has come through. If it peels off then you did not prep properly. It is not for new metal and not for over bodywork. All surfaces need to be sandblasted to create a clean rough surface and it requires a second coat as the first becomes tackey. Use it properly and it will last forever. I've always wanted to try this out, so once I seen this Starter kit available I jump on it. I actually bought three for small projects. Each kit covers anywhere from 4x4 are to 6x6 are, depending on how thick you put it on. I always debated trying the POR-15 product, because I didn't really know what and how much to buy. This starter kit sums it up for you. It's all in the preparation and this stuff works great. 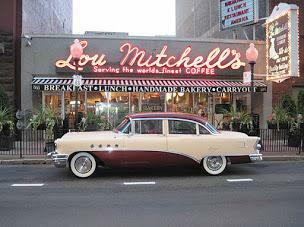 Be sure there is no loose rust, and this will stick forever. Even your hands if not carefull! I purchased this kit to paint some spindles and control arms. The process was very easy and the paint went on smooth and glossy. Definitely wear old (throw away) clothes when painting as the paint is hard to get out (or not). The small can was able to paint 4 spindles, 6 control arms and a Steering Rack with a little left over, however I did have to purchase more Metal Ready. I have been using POR15 for about 8 years and my original application is still in perfect shape. Thats 8 winters in Southern Ontario salt and still nothing has come through. If it peels then you did not prep properly. It is not for new metal or over bodyfillers. My surfaces are always sand blasted to a clean rough surface. A second coat is required when the first coat gets tacky. Do it right and it will last forever. I had no idea this was so solid! This is MUCH thicker than any spray on/paint coating! It is a little messy, so you need to keep brushing over the parts the POR15 might collect in (little pockets etc). Also tape up any holes that the solution may seep into. This stuff dries very hard, so it will be difficult to remove when it is dried. Otherwise, I think it will protect the metal for a long time. I recently used the starter kit, and am completely satisfied with how this product works. If you follow the instructions to a tee, and don't deviate this stuff works great. I do wish it came in a spray can, but aside from that, it covered the rust, and was actually easy to prep for paint. Also, the paint stuck just fine. Will be using it on the frame and suspension parts as well. 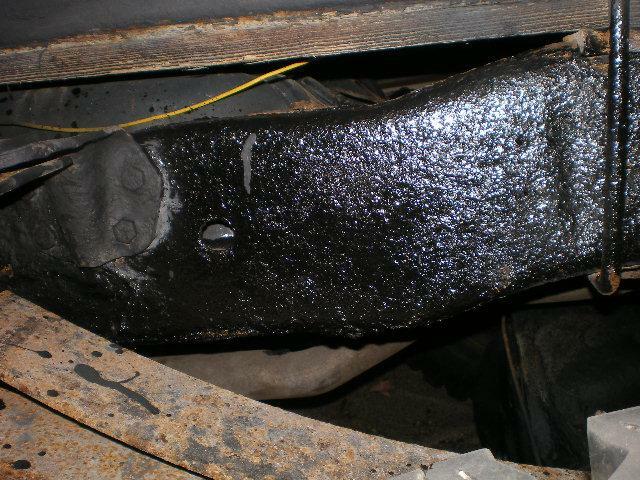 I just used the POR-15 on my rusty bed wheel well of my 97 Nissan pickup. I know it will do the job, because I used this product 6 years ago on my Jeep Commanche pickup. It has not rusted in the spot I used it. It has been exposed to snow and salt every year. Worth the price. I used the starter kit both times. Use those gloves! I used the kit as directed and had great results. I cleaned up a car rim at the tire beat, degreased, applied the metal prep, and applied the corrosion inhibiting paint. The tire was mounted and its holding air. I definitely recommend this product where applicable. I had water collect in my trunk while in storage, It had rusted the tire spark area. I got the POR-15 kit and it was just enough to cover the area. Works great! One less thing to do on the project. the starter kit was a great way to sample all 3 por 15 products without a big investment. i was amazed with all 3. reordered immediately. This kit worked great for a small project. The chemicals did what the labels said they would. Very satisfied. 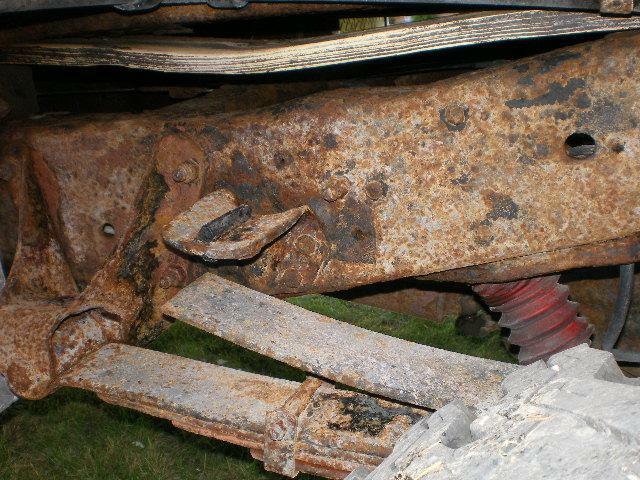 Used on truck frame after it had a patched welded onto it. Looks great and has held up well! I bought this a couple of weeks and i am glad I did. the best anti- rust kit i ever had. Wanted to try a small sample for years and found a starter kit !works as stated will see how it holds up this winter.my pickup is a 1978 F-250 4X4.And it gets plenty of use in the cold months! A little pricey, but overall it's a great product. It works as says with the proper prep. I used it on my 1987 Samurai which was used off-road only prior to me buying it. That being said, it was in terrible shape and had quite a bit of rust. This product took care of it fairly well and works especially well for a vehicle in bad shape when a perfect "show car" finish isn't desired. I only say that because if you want that kind of finish, you should simply replace the panels affected..